Salzburg's Old Town- A Self-Guided Walking Tour | Travel? Yes Please! One visit to Salzburg’s Old Town is all it takes to realize that the city incorporates the very best of Austria, into one pretty little package. Sprawling mountain views, ornate baroque architecture, pretty palaces, bustling market squares and of course, the music of Mozart, all make Salzburg one of Austria’s top tourist destinations. We spent a day and a half in Salzburg and found that to be the perfect amount of time to see the main sights, without feeling rushed. 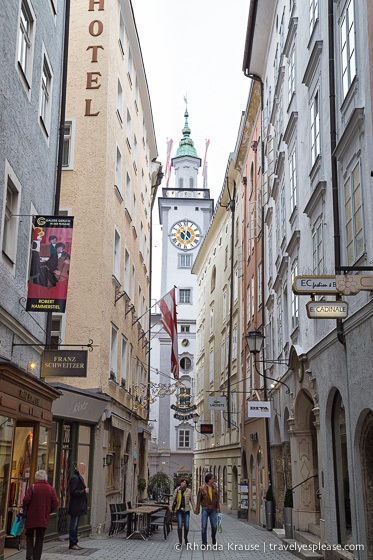 Most of Salzburg’s tourist attractions are concentrated in and around the Old Town (Altstadt). Their close proximity makes it easy for visitors who only have a short amount of time to spend in Salzburg. Salzburg’s Old Town is one of the best-preserved city centres north of the Alps. Famous for its baroque architecture, alpine setting and picturesque location on the Salzach River, Salzburg and its historic centre charms and delights many visitors. The Old Town of Salzburg earned a spot on UNESCO’s World Heritage List in 1997. The designation as a World Heritage Site and the city’s strict preservation laws, have helped protect the architecture and layout of Salzburg. Countless narrow, cobblestone streets merge into famous squares dotted with historic buildings spanning the centuries. You may not know it, but you’ll see architecture from the Middle Ages, Romanesque, Baroque and Renaissance periods. Salzburg has many interesting attractions and a stroll through the Old Town is just a starting point for discovering all that Salzburg has to offer. Here’s a sampling of places to see in Salzburg’s Old Town! A very noticeable landmark in Salzburg is the bell tower of the Old City Hall (Altes Rathaus). The building was originally a burgher house until the city purchased it in 1407 to use as the City Hall and court of justice. The Rathaus still contains government offices, but the mayor and city council now conduct business at Mirabell Palace. Seeing as how I’m not much of a museum person, I thought my favourite part of Mozart’s birthplace would be the canary-yellow façade. It was actually quite interesting to learn about Mozart’s life and see the house where he lived from birth (in 1756) until age 17. There are many musical instruments on display including one of Mozart’s baby sized violins. Mozart’s Birthplace is located on the Getreidegasse, Salzburg’s most famous (and busy) shopping street. I don’t like to shop but I did enjoy looking at the wrought iron guild signs hanging from the tall buildings. Make sure you take a peek down the passageways leading away from the main street. You’ll find some beautiful courtyards! Nestled at the foot of Mönchsberg mountain is St. Peter’s Cemetery, one of the oldest cemeteries in the world. St. Peter’s Cemetery is the final resting place for many notable people including Sanction Solaria (architect and builder of Salzburg Cathedral), Mannerly Mozart (Mozart’s sister) and Michael Haydn (composer and Joseph Haydn’s younger brother). Carved into the rock of the Mönchsberg are catacombs and two chapels believed to be of early Christian origin. St. Peter’s Abbey is also very old, dating back to about 700 when it was founded by St. Rupert. That makes it one of the oldest monasteries in the German-speaking area. St. Rupert is entombed in the abbey. Salzburg’s Old Town is overlooked by its key landmark, Hohensalzburg Fortress. This medieval castle is the largest fully-preserved fortress in central Europe. It’s so imposing that it has never been conquered by enemy troops. Read our full post about Hohensalzburg Fortress. If you’re walking towards the fortress, you’ll most likely come across the Kapitelplatz, or Chapter Square. On the south side of the Cathedral, this spacious square was once the site of the Cathedral Abbey, where the high clergy resided. Today, the square’s prominent attraction is an art piece called “Sphaera,” a large golden sphere with a man perched on top. Standing tall above the Domplatz is Salzburg’s Cathedral, dedicated to St. Rupert and St. Virgil. The pale marble façade and large dome will command your attention, but it’s the interior that is especially eye catching. The cathedral has been destroyed by fire, and consequently rebuilt, a few times in its history. The entrance gates bear the numbers 774, 1628 and 1959 in memory of the cathedral’s three consecrations. Salzburg’s Residenz is where the prince archbishops held court and managed the affairs of their country. Today, 15 of the 180 rooms are open to visitors. We didn’t go on a tour because we had already seen so many palaces during our five weeks in Europe, but I’ve heard they are quite lavish. Residenzplatz is the heart of Salzburg’s Old Town. The west side is dominated by the Residence, the east by the New Residence. Residence Square is home to what is considered Salzburg’s most beautiful fountain. The Residence Fountain is decorated with horses, dolphins, giants and is topped with a Triton shooting a jet of water from a conch shell. The square is a popular place for watching concerts and live showings of sporting events. It is also hosts Salzburg’s Christmas market. As the name suggests, Mozartplatz is a square dedicated to Salzburg’s most famous resident, Mozart. The square prominently features a statue of the composer, which was unveiled in 1842 in the presence of Mozart’s sons. Mirabell Palace is not in the heart of Salzburg’s Old Town, it’s just across from it on the right bank of the Salzach River. The palace and gardens were my favourite spot in Salzburg and were the perfect place to take a rest from exploring the city. Read our full post about Mirabell Palace and Gardens. If we ever visit Salzburg again I would like to visit Hellbrunn Palace. It’s about 5 km from the city centre, on the southern fringe of the city. The palace’s main attraction is its hidden “trick fountains”. There wasn’t anything we didn’t like about Salzburg, but for some reason we didn’t fall in love with the city. That’s okay though- it’s unrealistic to think you’ll connect on a deeper level with every place you visit. However, we did like Salzburg much more than Vienna, Austria’s other major tourist destination. Salzburg is about a 2.5 hour train ride from Vienna. The train station is about 2 km from Mozartplatz, in the Old Town. Tourist offices can be found at Mozartplatz 5 and the train station. We didn’t buy the Salzburg Card, but it gives free admission to Salzburg’s attractions and free public transport in the city. This pdf brochure will give you more detailed information to help you decide if the Salzburg Card is a worthwhile investment for you. You can buy the card online here or at tourist offices, city ticket offices and hotel reception desks. Here is a trusted site that has a large selection of tours and tickets for activities in Salzburg. You can book everything from city tours, Sound of Music Tours, concerts, boat rides, and day trips out of the city (including to the lovely Hallstatt). Here is a list of hotels in Salzburg. Please consider booking your Salzburg accommodations through the included link. It costs you nothing extra and helps support this website. Thank you! Purchases made through the included links earn us a small commission, at no extra cost to you, and help support this website. Thank you!